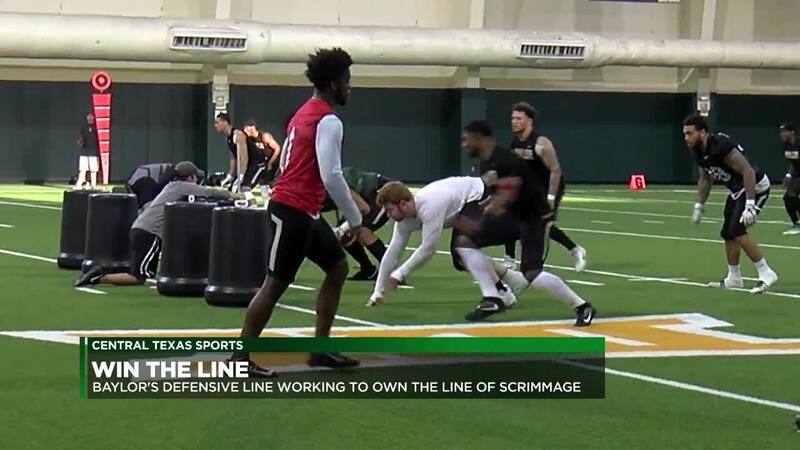 WACO, TX — Baylor football is still grinding away on the gridiron. Joey McGuire has switched from coaching tight ends to defensive ends, and now he's working alongside Frank Okam, Baylor's defensive line coach. The emphasis for the D-Line is being violent and controlling the line of scrimmage. If they can do that, they'll be able to get to opposing quarterbacks. "This is the Big 12. This is a league where it's offense and quarterbacks and play action pass and deep balls, so the D line has to be able to stop the run and make things one dimensional. When you do that, you have to win on edges and get to the quarterback," Coach Okam said. James Lockhart is the leader of the group, but he's a big fan of the new kid on the block, Templ's own TJ Franklin. "I'm a TJ Franklin fan, I'll say that. I'm no coach, I'm no Frank Okam, but TJ's a guy that I have the utmost respect for. He's a 17, 18 year old kid, and right now, he should be in high school. He should be hanging out with the guys he grew up with and getting ready for prom, getting ready for graduation, and he's here in Waco, Texas trying to get better, trying to become a very good football player. And I think ultimately, he will one day," Lockhart, Baylor's senior defensive end, said.